Having been asked to chair the Sustainable Energy Committee of The Gas Drilling Awareness Coalition, I had one of my Aha moments. 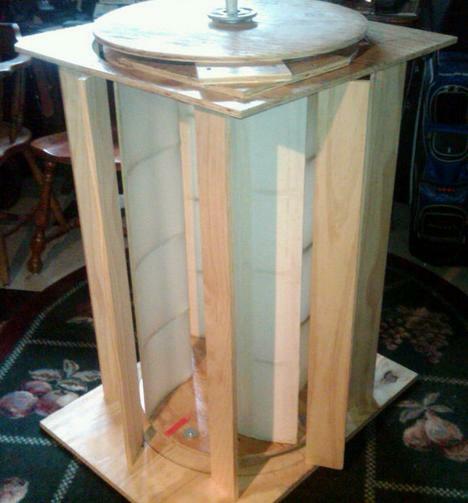 If I’m going to talk about wind power…why not make a working prototype of a wind generator, and see how much power it can generate? Solar is still on my list of actual prototype systems to get up-and-running….Wind generation, however, really lends itself to the garage/back-yard experimenter right now because of it’s reasonable initial cost to get a system demonstrator working. So what type to build? Off to You-Tube I went. This type of turbine caught my attention, so I pretty much designed mine around it. All wood in the project is treated with two coats of “Varethane” floor seal. The first step is to cut out two disks of plywood. They are both 20 ½ “ diameter, one being the bottom plate of the turbine, and the other the top plate. 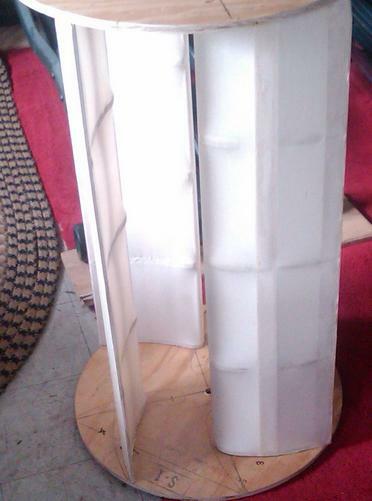 The vertical vanes of the turbine are 34 ⅛” long, and have the profile of an airfoil. This looks like typical model airplane construction with ribs and stringers, and indeed I used to build a lot of model airplanes when I was young, so this gave me the idea to build the vanes strong, yet light. I covered them with fabric like earlier aircraft were, shrunk it twice with water, and applied several coats of “Varethane” water soluble floor seal. 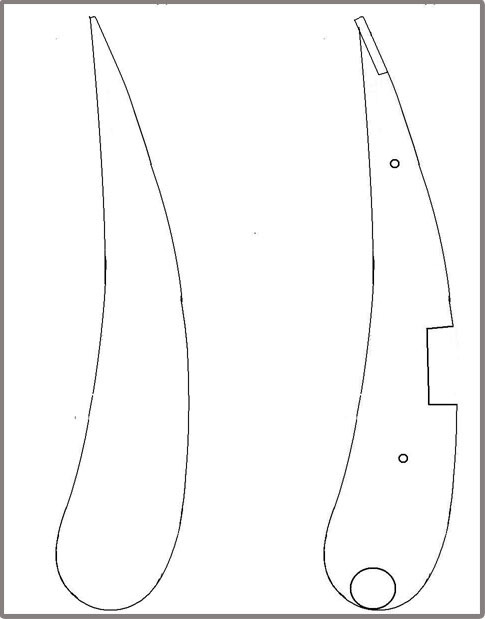 A wood furring strip forms the trailing edge of the airfoil, and a ¾” dowel forms the leading edge. Two holes were bored in the ribs so that ¼ x 20 threaded rod stock could be strung through the end ribs to act as a clamp holding the parts together while the glue dried. ( Gorilla glue…good stuff). 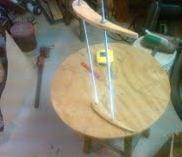 Intervening ribs are installed, and the stiffener, leading edge dowel, and the trailing edge are glued up. Remove the threaded stock. Cover the vane with Muslin. Use glue and pins to keep it in place until it dries, spray with water to shrink the muslin tightly over the vane. Wait for it to dry and spray again with water to shrink it two times. 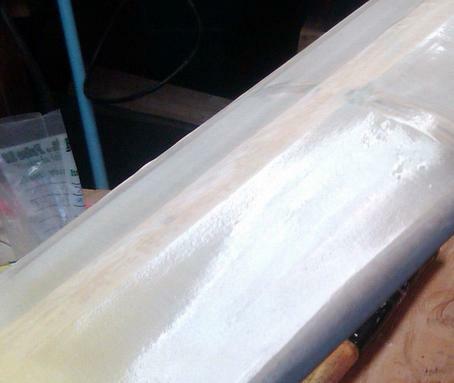 Varethane is applied, and sanded lightly between coats. It takes about four coats to get good results. When all four vanes are finished, they are “sandwiched” between the upper and lower disks, and form the moveable part of the generator called the Rotor. 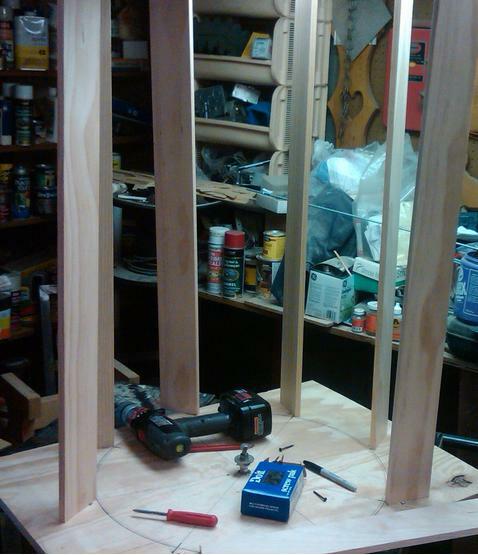 We build a framework on a piece of plywood to hold the whole thing together, which we will call the Stator. The vertical ribs of the stator are mounted at the same angle as the vanes to direct the wind toward the vanes at the optimum angle. One of the advantages of the VAWT, is it doesn’t care which direction the wind is coming from….even if it is variable. I didn’t have a good precise set of upper and lower bearings for the unit yet, so I just assembled the whole thing with bushings for it to spin upon. It is designed to come apart as often as you wish to make changes to the system. Just for fun, I put it all together, and set an electric fan next to it, to “run-in” the bushings with a little oil. Worked pretty good, however the friction of the bearings in a wind turbine is the biggest cause of lack of output. I decided to splurge a little, and buy some new ball-bearing sets. I hope to get rotation in breezes less than 15 MPH. When the new bearings arrived, I installed them on the unit to see how they would respond to the wind. The bottom bearing on the rotor is a “Lazy Susan” type arrangement which I found on the internet, and has a rating of 500 pounds ! So far the max rotation speed is 5 MPH, which is right on the money. The unit has been operating for over one hour, and the average speed is .8 MPH. During the first test run, the wind was not a good steady 20 mph, but all looks well. The unit is still in tweaking stage, so please check back for more updates.